From our Cashier, select Transfer to Player. Enter the Stars ID of the recipient. Enter the amount of money to be transferred and add special instructions for Support if needed. Choose Continue and on the next screen Submit Transfer Request. We will then review your transfer and process it as soon as possible. Depending on a variety of factors, we may require identification documents and other information from you and/or the recipient to comply with our regulatory requirements and to protect the integrity of our transfer facility. 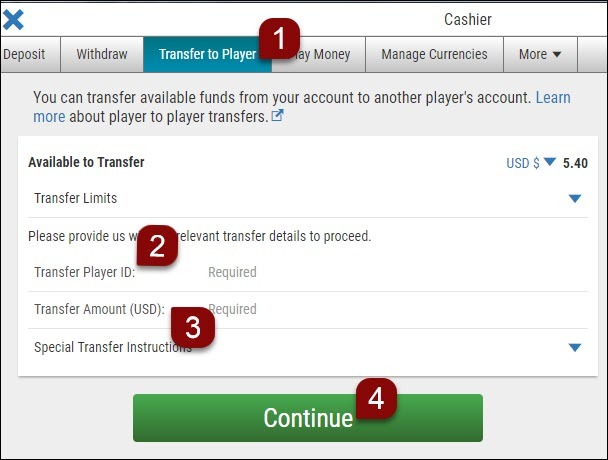 Transfer feature is intended to help players fund their accounts so that they can play at our tables. You are able to transfer funds from winnings, but for security reasons, players are unable to transfer funds originating directly from deposits or other transfers. All transfers are subject to review before they can be approved. If you wish to stake other players without playing at the tables yourself, we recommend that you send funds to these players using a money transfer service outside of our site.